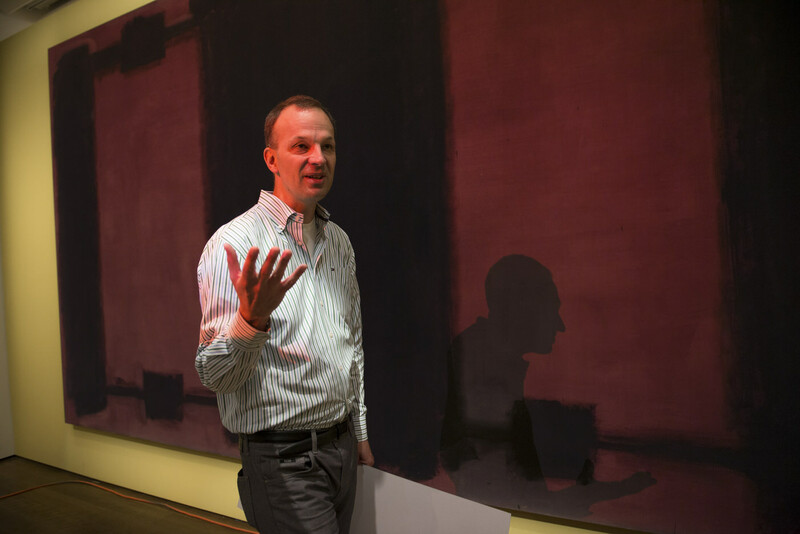 Conservation scientist Jens Stenger explains the history of Mark Rothko’s Harvard Murals and the details of the conservation project in front of the now-faded Panel Four. Stenger demonstrates the digital light projection technology that restores the murals to their original colors. 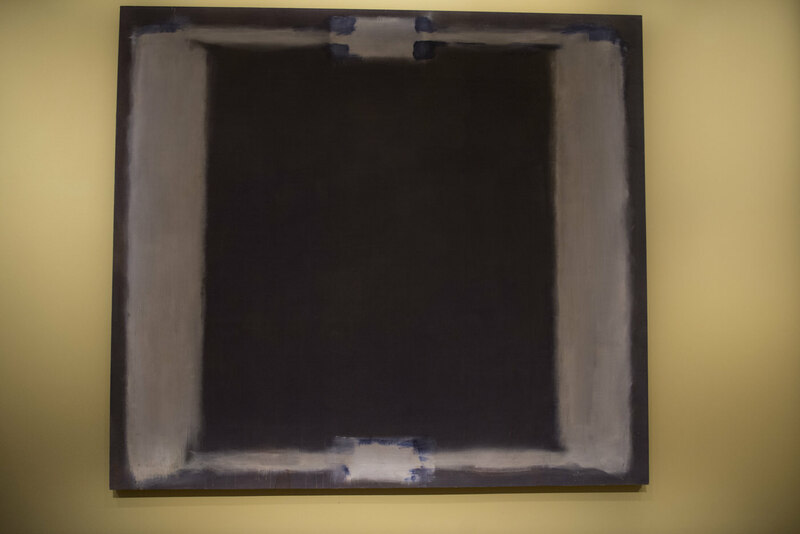 The background of Mark Rothko’s Panel Four exhibits different stages of color loss. The digital light projection technology illuminates the panel differentially, restoring the uniform original color. Panel Five originally exhibited a pink figure on crimson ground. Ancient architecture inspired the composition of the murals, in which the figures resemble classical columns. Harvard’s Center for the Technical Study of Modern Art and Straus Center for Conservation and Technical Studies worked with MIT Media Lab’s Camera Culture Research Group to develop a software that uses compensation images and digital light to restore the colors of the Harvard Murals. Since 2008, Harvard’s Center for the Technical Study of Modern Art (CTSMA) and Straus Center for Conservation and Technical Studies have worked in conjunction with Ramesh Raskar, an expert in computational photography at the MIT Media Lab’s Camera Culture Research Group, to develop a software that uses noninvasive digital light projection as a tool to restore the appearance of Rothko’s original colors. “It’s an amazing opportunity to develop something that hasn’t been done before,” said Narayan Khandekar, senior conservation scientist at the Straus Center. Forms of digital projection had been used on tapestries and architectural elements, he explained, but no one had applied the technology to paintings. According to Mary Schneider Enriquez, Houghton associate curator of modern and contemporary art, the new exhibition will restore the murals as a work for art historians to study. “One of the tragedies has been that the Harvard Murals have basically not been recognized in art history…as they should be,” she said. 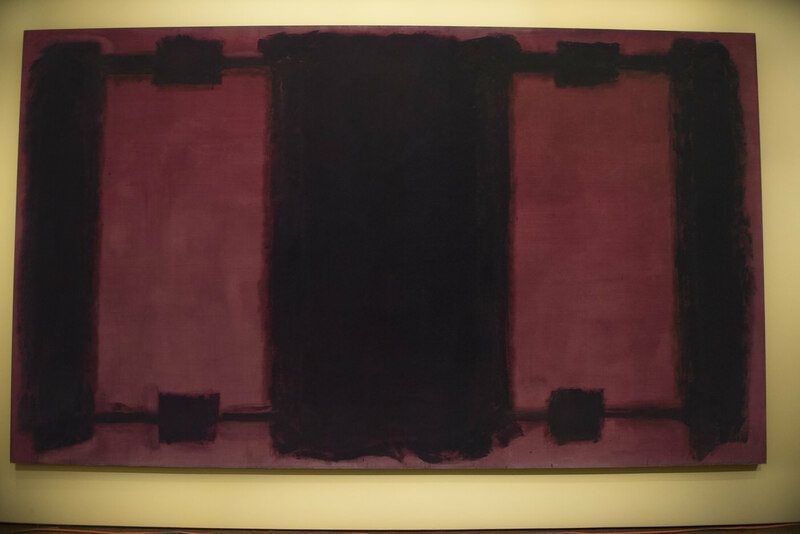 “One of the several things this exhibition will do is to bring them back into the discourse on Rothko’s history and [their] importance within his trajectory in art history.” The murals are one of only three commissioned series Rothko executed; the other two are the Seagram Murals, painted in the late 1950s and destined for the Four Seasons restaurant in New York City, and the Rothko Chapel in Houston, which was completed after the artist’s death in 1970 and hosts 14 of his paintings. The museums’ news release recounts how talks about Rothko’s commission began in 1960, when then-economics professor Wassily Leontief, chair of the Society of Fellows, suggested that the artist create a series of works for the penthouse dining room planned for the new Holyoke Center. 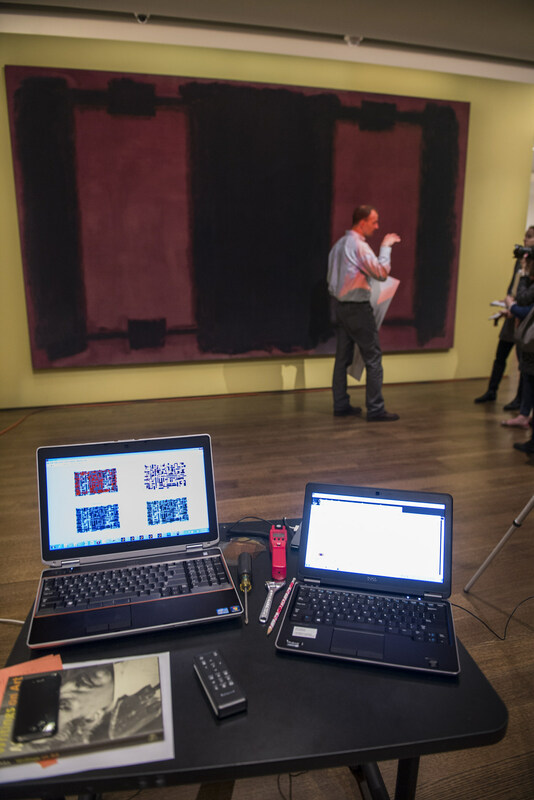 With the support of John Coolidge, then serving as the director of the Fogg Museum, Rothko painted the large-scale canvases to be donated to Harvard between 1961 and 1962. But soon after installation of the works in 1964, their backgrounds, which Rothko painted a bright crimson, began to fade differentially. According to Jens Stenger, the former Straus Center conservation scientist (now at Yale) who has been leading the conservation efforts, in the late 1970s the paintings were taken down and stored in a warehouse. They have rarely been on display since, but Stenger said that during a 1988 temporary exhibition, then conservation scientist Paul Whitmore studied the paintings and determined that the color loss was due to the presence of lithol red, a light-sensitive pigment. 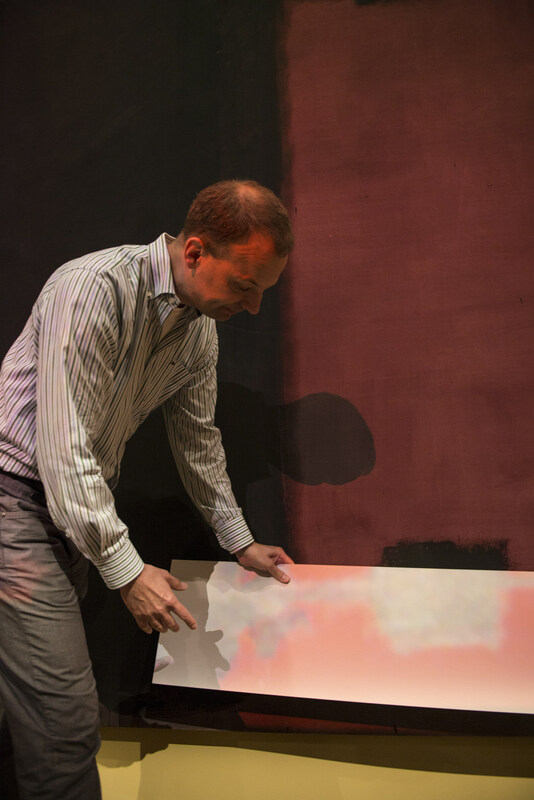 When the Straus Center and the CTSMA began working on Rothko’s paintings 20 years later, they faced the challenge of establishing what the backgrounds had looked like almost 50 years ago. According to Stenger, Rudolf Gschwind, a digital-imaging expert at the Digital Humanities Lab of Basel University, helped the Harvard team to determine the original background color of the murals. The exhibition will coincide with the opening of the new and expanded Harvard Art Museums complex, which will bring the Fogg Museum, the Sackler Museum, and the Busch-Reisinger Museum under one roof. Where the paintings will go after the inaugural exhibition ends, curators and conservation scientists said, is the subject of continuing discussion. Read the Harvard Art Museums' press release. Francesca Annicchiarico ’16 is Harvard Magazine’s inaugural Daniel Steiner Undergraduate Editorial Fellow. The Dunster House resident and social studies concentrator comes from Portogruaro, Italy.